Experience the exotic trails and sights of the world famous Vasquez Rocks Natural Park in Southern California. Known as the backdrop for popular TV shows and movies including Star Trek, The Flintstones, Battlestar Galactica, Planet of the Apes, and many of our favorite classic westerns films. 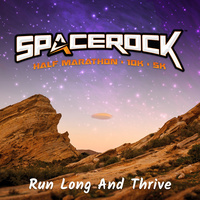 Now get a spectacular experience running the trails at the SPACEROCK Trail Race! Vasquez Rocks features unique rock formations and canyons that feel like your running on an alien planet. The trail race features a variety of exotic trails through and around the iconic Vasquez Rocks. Experience the darkness of running into the black hole tunnel taking runners under the 14 freeway. The race will be on Saturday, October 12th, 2019 and start shortly after sunrise. The start and finish line is located inside Vasquez Rocks National Park in the open space area in the park. The SPACEROCK Trail Race trail race offers distances for all types of runners, whether you're new to running, casual runner, a walker, or a seasoned runner looking for a challenging and technical trail, choose the distance that fits you best for a spectacular trail race experience.